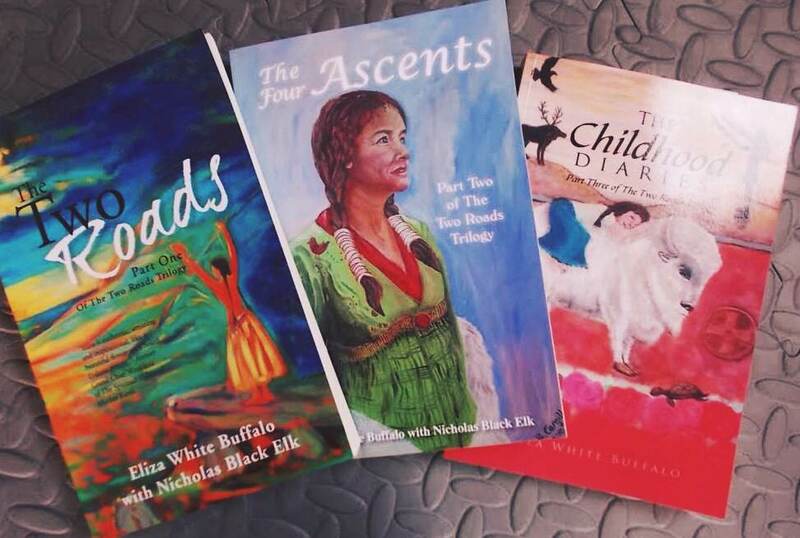 The Two Roads Trilogy, by Eliza White Buffalo, brings acceptance and understanding of the collective human story of suffering and redemption. It is based on the author’s soul experiences and teachings of her twin soul and spirit guide, Lakota Sioux Holy Man, Nicholas Black Elk. In his lifetime, 9 yr old Black Elk experienced a great vision of a new world where all life lived in harmony; this light encoded trilogy is based on the two roads and four ascents of that vision, as well as Black Elk’s higher understanding of the teachings of Master Jesus. Since the trilogy tells every soul’s process of crucifixion and ascension, readers have told of how they felt the story was about them, and how they changed as a result. The Two Roads Shamanic Centre is situated at the foothills of The Sperrin Mountains, just outside Omagh in County Tyrone where the author runs workshops such as Revealing The Shaman Within Parts 1, 2 and 3, and Coming Into The Red – focussing on creation and ascension. She also runs regular meditation groups, prayer meetings and shamanic sound baths, as well as doing one on one healing sessions and spiritual guidance. Find ‘The Two Roads Trilogy’ on Amazon UK and all good on-line book stores.